as they talk with me about their new track, Isle of Mine. I ask what the story behind the song is and what we will get from their upcoming album. The band discusses their musical tastes and how Death Machine found one another. The Danish band recommend rising artists to watch and reveal what their touring plans are; if there is any time to chill away from music; what advice they would give to artists coming through right now – they end the interview by selecting a song I have not heard before. Jesper: Besides being a musician, I also work as a graphic designer and the last week has been really busy. Too much work! (And surrounded by people who don’t recognise all my efforts). Quite a crappy week, actually. But, I’ve also, with great excitement. Been looking forward to releasing our new single. Morten: Hi. We are a lo-fi Folk band called Death Machine. The band consists of Jesper Mogensen on Vocal and Guitar, Simon Christensen on Keys; Sven Andersen on Drums and Morten Ørberg on Bass. Death Machine's musical expression is based on American lo-fi Folk and likes to mix traditional songwriting with more abstract chanting elements. We play music that mixes spherical and earthy elements. Isle of Mine is your new single. What is the story behind it? Jesper: When I write songs, I start out playing around on the guitar while singing complete nonsense. In this case, I kept singing the words "isle of mine". When I began writing the lyrics for the song, my first intention was to delete that phrase but, as the words got down, it suddenly made sense. My subconscious is always one step ahead I guess. I write about stuff from my own life and Isle of Mine is about finding a way back to yourself at the end of a relationship. A sort of defence mechanism where you try to detach yourself from your partner. I believe a relationship is dead a many years before the actual breakup. In this state, we tend to live in mentally solitude. Living on separate islands. It is from your upcoming third record. Can you tell us what sort of themes and ideas influenced the material? Yes. Isle of Mine is from our forthcoming album. We are still in middle of recording it and are still experimenting a lot, but I guess we tend to seek a more tribal kind of feeling on this album. More heavy beats than on our previous two albums. How did Death Machine get together? When did you start playing together? Morten: In 2013, Sven and I played in another band. Jesper had been to a couple of our concerts, but we never really spoke a lot after these concerts. But, when Jesper suddenly did not have musicians for a band for a Death Machine showcase, he contacted us. We only played one concert and then went to each side. Several months later, we met randomly at a bar where we decided that Death Machine should be a trio and immediately started writing songs together. The first song that came out of it was the song Loans. Not long after we got Simon on the keys because we had difficulty creating the spherical sound on the stage. Simon was the perfect match; the starting point for our collaboration is and always has been that the music is central and not the single band member's ego. You are based out of Denmark. Is there a healthy and promising music scene there? Jesper: In my experience, the Danish music scene has never been better. There are so many talented people and new bands all sounding like professionals. I think it has to do with the new technological opportunities. You can record an album in your bedroom and it sounds great. You don't need expensive studio time anymore. Do you each remember the artists you followed growing up? Who do you rank as idols? The most important artist is difficult to say. You keep evolving as a person and your taste in music changes. But, the first musician who inspired me was Michael Jackson. I wanted to learn to dance like him. Then, later, I started listening to techno. But, the Grunge wave made me want to play music. The Danish band Psyched Up Janis got me into playing drums. I don't listen to any of them anymore though. Recently, I've been listening a lot to Bonnie Prince Billy. Kind of my idol at the moment. Simon: I still remember the kind of breakfast I had when I heard on the radio that Freddie Mercury had died. Queen were my childhood idols. Live at Wembley was a very worn V.H.S. Since then, Mogwai, Sonic Youth; Radiohead, Grandaddy and Arab Strap…my idols are still Thom Yorke, Thurston Moore and Freddie Mercury. The best concert in a while was Florence + the Machine at Roskilde. Jesper: By the end of 2018, I hope the new album is ready to be released. That is my focus at the moment. My favourite memory has to be our concert at SPOT Music Festival. 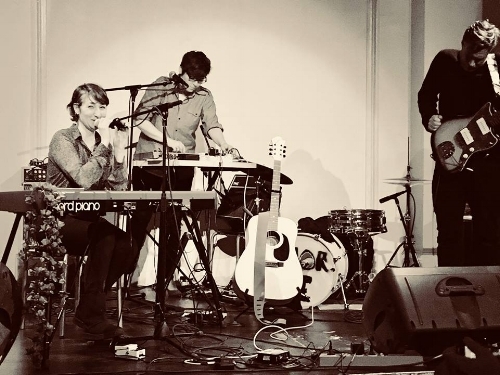 The venue was perfect for our music and, before the concert, we were very nervous as to whether anyone would come to see our show – but, luckily a lot did and we got really nice feedback. A lot of good stuff has happened since then. Morten: It's hard to answer. I have many favourite albums, but I especially like Pink Floyd's Dark Side of the Moon, Fleetwood Mac's Rumours and The Beach Boys’ Pet Sounds - because these three masterpieces cause both memories and big feelings and I never get tired of hearing them. Simon: It’s difficult to say, but maybe Sufjan Stevens’ Illinois album. That album got me into the Folk genre. I kind of found my place as a musician: what I wanted to do and could do. But, there are many good albums out there. All of them inspiring. Don't know about the rider, but I could be cool to support Bonnie Prince Billy or Radiohead. Hopefully, chat a bit with them too. Jesper: Unfortunately, we don't have any U.K. dates but we have a lot dates around Germany, Austria; Switzerland and Denmark this autumn. Just check our Facebook. Don't have that much advice because we still in the middle of coming through. But, I guess a general piece of advice would be to remember to be true to yourself and the music you make. There is a new band called Palace Winter. They write really good songs! Also, Marie-Louise Munck. She is, in my opinion, one of the best singers in Denmark. Jesper: Don't have that much spare time - but I like Netflix. Simon: Not much time, but watching the Premier League; playing with my girls and drinking coffee are some of the ways I relax.